The Middle East and North Africa improves its average performance this year, in part because the new normal of low oil and gas prices is forcing many countries to implement reforms to increase diversification. Across the region, the most-improved country this year is Egypt (101st, up 14). Looking at the data over the past decade, it becomes clear how the fall in oil prices has affected the macroeconomic environment in the region, which used to lead the way in this dimension (Figure 8). This has mainly affected some Gulf Cooperation Council economies’ macroeconomic performance negatively. In many other countries, the fall in oil prices has increased the fiscal space because energy subsidies could be reduced. On the positive side, heavy investment in digital and technological infrastructure has allowed major improvements in technological readiness, but these have not yet led to an equally large turnaround in the region’s level of innovation. The growth in market size also slowed down after 2015 with the decrease in oil prices. 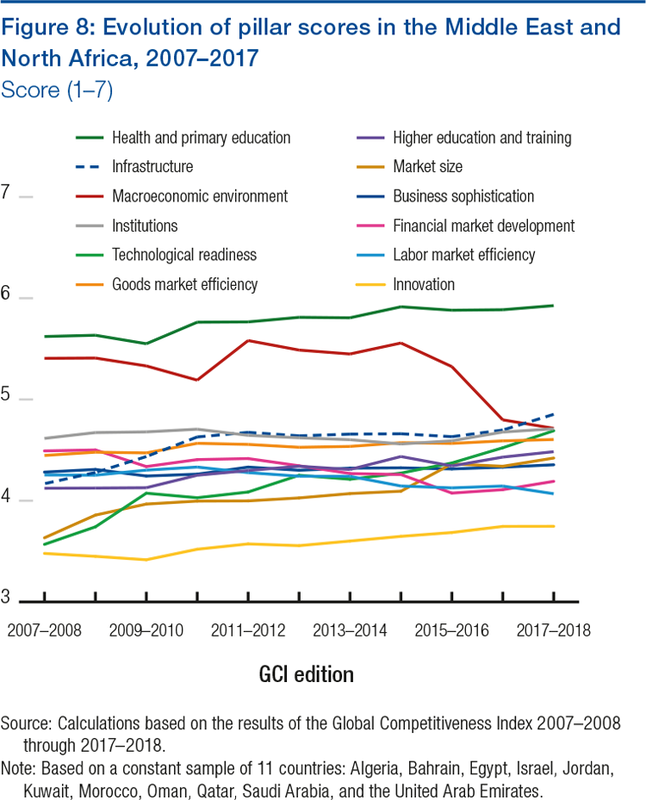 The United Arab Emirates (UAE) (17th) improves its absolute assessment and continues to lead the Arab World in terms of competitiveness, but it loses one place as other countries post even larger gains. This improvement shows the resilience of the UAE economy, in part due to increased diversification, which is reflected in its strengthening macroeconomic environment and its ability to weather the double shock of lower oil and gas prices and reduced global trade. Although the IMF predicts GDP growth to drop to 1.3 percent this year, non-oil growth is expected to pick up, suggesting that the country’s diversification strategy is bearing fruit.10 To further increase its competitiveness, the UAE will have to speed up progress in terms of spreading the latest digital technologies (36th) and upgrading education (36th). Saudi Arabia (30th) slips one position, with a relatively stable overall performance. The macroeconomic environment has improved slightly after the 2015 oil price shock, but financial market efficiency (down 10, at 57th) has deteriorated as interest rates increased in 2016 and credit growth slowed. The country has stable institutions (27th), good-quality infrastructure (29th), and the largest market in the Arab world (15th). Saudi executives see restrictive labor regulations as their most problematic factor for doing business: the labor market is segmented among different population groups, and women remain largely excluded. Another concern is the lack of adequately educated workers: although tertiary enrollment is strong at 63 percent, more efforts are needed to advance the quality of education and align it with economic needs.